Home food marketing food packaging labeling Marketing marketing tools packaging What Purpose Does Packaging Serve? What Purpose Does Packaging Serve? Take a minute to think about the last packaged product you purchased. Was there anything about the package that drew you to it? Perhaps the size, shape, color, or story about the business on the label? Or, perhaps you prefer glass to plastic. I know that when I'm traveling and stop for a snack, I'm usually looking for something in a resealable package (I don't want my snack getting loose in my bag or car, after all!). like this one, when traveling. 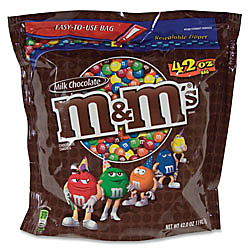 Containment - Obviously, with multi-item products, such as my M&Ms, they need to be contained in some fashion. As do food products such as juices, jams, sauces, etc. Protection - There are many reasons we want our food products protected through the use of packaging - protection from the elements, from possible tampering, from shock, vibration, etc. Packaging helps to ensure that food items are in the same condition when the consumer purchases it as it was when produced. Information - Packaging serves as a convenient place to provide a variety of information to the consumer about the product itself, as well as the company that produces it. Information can range from legal requirements, such as nutritional information and ingredients, to stories about the company background or founders. Product packaging also conveys information in the form of "trade dress," or the set of visual characteristics that help the consumer identify products from the competition. Utility of Use - Let's face it, packaging makes life easier when it comes to using the product, whether it be pouring, dipping, or storing the item. The right package can make a big difference. Every mix of packaging material(s), color(s), size, and other characteristics sends unspoken messages to your customers about your product. I'll discuss some of these elements in coming posts. However, food entrepreneurs should first be concerned about these four functional aspects of packaging.